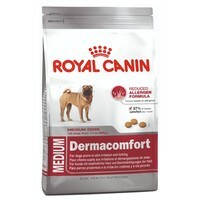 Royal Canin Dermacomfort helps maintain skin health by limiting protein sources that are recognised as possible allergens in dogs. The proteins used have been selected for their very high digestibility, as a result of this, Dermacomfort helps sustain healthy skin. A patented complex of one amino acid and 4 B group vitamins to help support the skins barrier role. This delicious food is packed with essential vitamins, antioxidants, Omega3, Omega6 essential fatty acids. Ingredients: Rice, wheat gluten, animal fats, wheat, maize gluten, maize, husked oats, hydrolysed poultry liver, minerals, soya oil, beet pulp, fish oil (source of EPA and DHA), flax seeds (source of omega 3), fructo-oligo-saccharides, borage oil (source of gamma-linolenic acid), marigold extract (source of lutein). Medium – suitable for medium sized dogs aged from 12 months to 7 years.